Dive in to the next generation of Sony Sports CD Walkman players with the D-SJ301 S2 Sports CD Walkman portable CD player. The S2 Sports design was created to endure all your action packed sports adventures. Use active control playback operation, 64-track RMS programming and 9 playback modes to customize your listening experience with ease as you jog, blade, or board you way to fitness. Also featuring CD-R/RW playback, the D-SJ301 lets you enjoy CDs created on personal CD-R/CD-RW drives as well as commercially produced CDs! So get your music pumping, water resistant features help to keep out water, moisture and dirt, while the ultimate skip-free G-protection offers more protection against virtual shock. Meet your next sports challenge with the D-SJ301. Even though the Sony D-SJ301 is built like the proverbial Sherman Tank, most of these CD players are now between 10 and 20 years old. 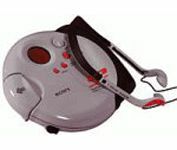 An age where virtually all portable CD players long ago gave up the ghost due to the failure of their laser mechanism.. In its defense, the D-SJ301 is a wonderful design that has aged beautifully over the years. And it is solidly built. Even its lid fastens with a security that belies virtually all of its competition, since most portable CD players exude a sense of cheapness that is illustrative of their inexpensive construction. Not only is the D-SJ301 beautifully made, it also sounds quite good. In fact, if you replace the junk ear buds that are included with this CD player with a quality set of *headphones, you will quickly find just how superlative this little jewel of a CD player is. well. This company's audio cables make the hi-end audio cables which have for eons been touted by the audiophile industry, seem ridiculously overpriced by comparison. As for the D-SJ301, its control buttons have a solid feel to them, and the attention to detail in the design of this CD player is readily apparent. However, this type of quality does not come cheap. With a list price of $399 back in the 1990s, the D-SJ301 is one of the more expensive compact disc players that was on the market before it was discontinued some years back. And the unit was not known to be heavily discounted in the way that many of its more cheaply made rivals were. So if you want one of these quality CD players today, you'll have to purchase it used, or find a New Old Stock one for sale (the equivalent of finding the proverbial needle in the haystack) - which is certain to be *very expensive. I was looking to play my old CDs and wanted a quality portable CD player. However, I was unimpressed with the current crop of portable CD players that remain in production, so I decided to purchase a used D-SJ301 for about $60. It arrived poorly packaged; just sitting in some bubble wrap that was not even taped around it. Then again, this player was designed to be jostled - one of its primary selling features, and largely responsible for its considerable price. and I will continue to document my experiences with the Sony D-SJ301. If this CD player remains durable I must consider it to be an excellent value at the price I purchased it at. CD player you purchased had a lot of (or minimal) use. Otherwise, the Sony D-SJ301 S2 Sports CD Walkman is highly recommended!